Hooked on Needles: Prayer Flag Quilt ~ Finally Quilted! The day the Animal Alphabet quilt went on the long arm, it was joined (quite literally) to this Prayer Flag quilt that I am showing you today. 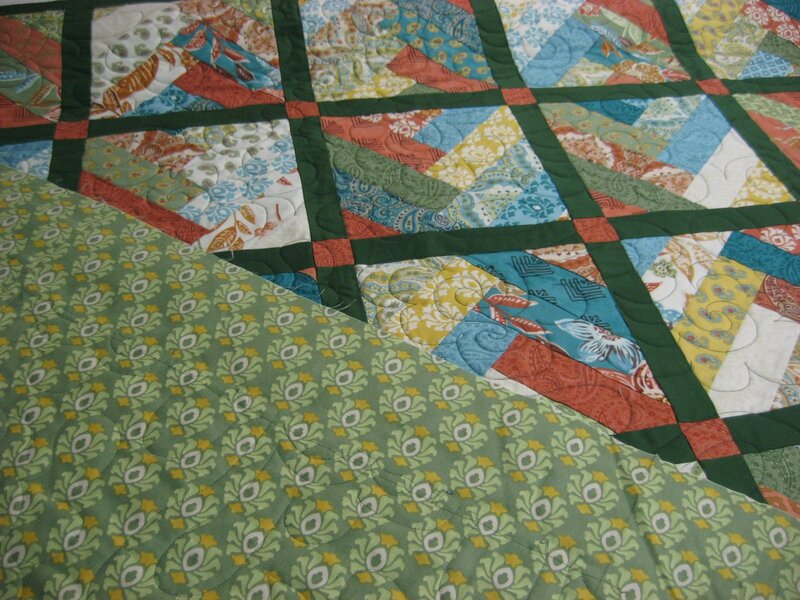 When I have two quilts that won't take too much time to quilt alone, I like to sew their backings together so I only have to load the backing once, and then I can quilt two quilts in one trip. Animal Alphabet and Prayer Flag were quilted one after the other instead of side by side, like the Sudoku and Love U quilts were. This is for two reasons: Animal Alphabet and Prayer Flag were too big to go onto the long arm side by side, and the thread color and quilting designs were different for each. Sudoku and Love U are both smaller quilts so they fit side by side, and white thread and the bubble quilting design were perfect for both. So if you are renting time on a long arm machine, keep that in mind when planning your appointments, especially if there is a minimum number of hours you have to pay for anyway! Here it is, all quilted and ready for the binding pile. It will be in good company this summer, as I've had the opportunity to quilt four other quilts recently. 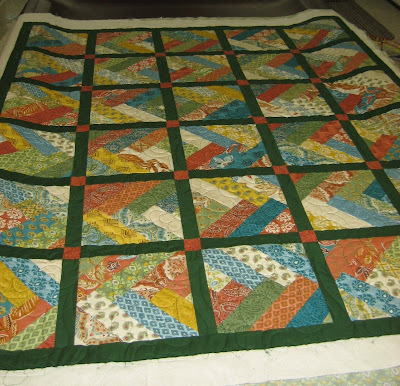 In this picture, you can see the green thread I used for the quilting design which was called something like Fluffy Clouds or Puffy Clouds, or something like that! Anyway, the design had lots of swirls and puffs and swoops that were so fun to stitch! 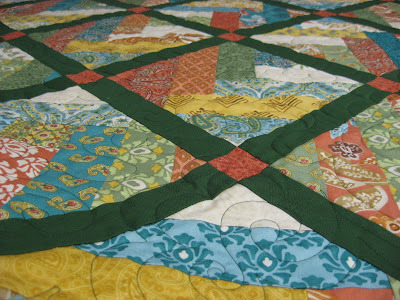 The original design for this quilt was based on the friendship braid pattern that uses a special ruler which I purchased on vacation last summer. You can see the special binding ruler HERE. And you can see the beginnings of this Prayer Flag friendship braid quilt HERE and HERE, and also find out why this quilt ended up being blocks instead of braided strips! You can see the backing fabric I used here which is just the fabric with nothing pieced into it. 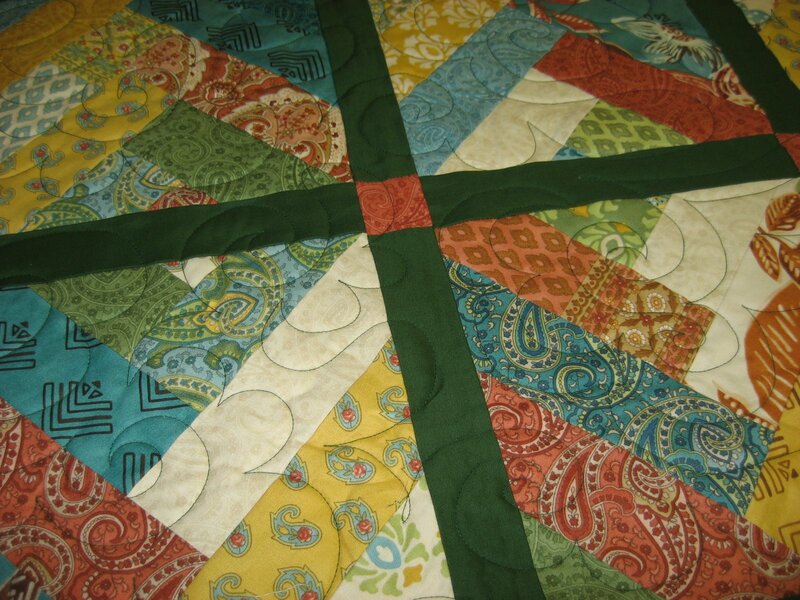 So once this quilt gets its binding, it will also show up in my Etsy shop for purchase. Are you busy making lots of fun projects this summer, or just relaxing and dreaming up stuff for the cooler weather?